Screening your company’s existing workforce can be a critical component in your overall security plan. But the process is far from simple—and is often intimidating. Learn from one company that has navigated the complexities, and consider their strategies to help you plan the process. 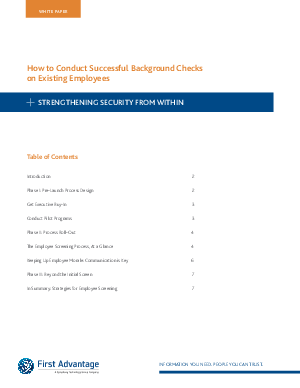 Pre-employment background screening is now considered a standard practice in Corporate America. Very few companies, however, are crossing the threshold to conduct screens on their existing workforce. It’s a complex endeavor, and to be successful, companies need to walk a fine line between addressing legitimate business and security risks and not alienating employees along the way.